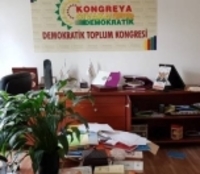 Over 100 people, among whom were also journalists and politicians, were detained in house raids conducted by the police as part of a Diyarbakır-based operation that was launched in nine provinces yesterday (October 9). The ones who were detained in Batman, Mardin, Adana, İstanbul and in other provinces were taken to the Diyarbakır Security Directorate. How did Newspapers Cover Fatal Train Collision in Ankara? Comments Off on How did Newspapers Cover Fatal Train Collision in Ankara?